Be the hit of the beach or pool with a Monogrammed Beach Bag. 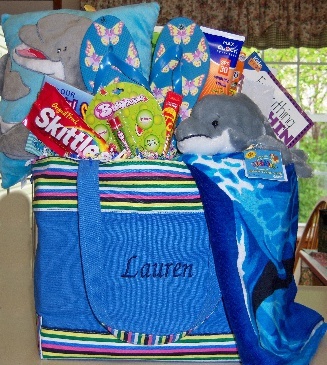 Contents include: A beach towel, flip flops, suntan lotion, lip balm, chips, beverage, candy, pretzles and cookies. A great gift for a graduation or birthday. Bag comes in pink, green, or blue.